Inspire your inner genius with this pewter paperweight etched with some of Albert Einstein's wisest words. 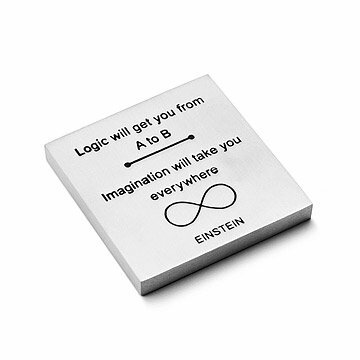 Smarten up your thinking spot with a sophisticated, 100% solid lead-free pewter paperweight embellished with some of Albert Einstein's wisest words. Made in Providence, Rhode Island. I thought it was nicely made, clean lights and very sturdy. I had anticipated it being a little bigger but it ultimately is just the right size. Nice little paperweight with a great message. Great gift for a volunteer. I expected it to be larger. But, it works just fine, the size it is. The sentiment was perfect, because it was for a person who thinks outside the box. I am always looking for unique, individual gifts and I found that at Uncommon Goods!